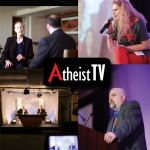 Atheist Geek News » Atheist News and Links » AtheistTV Goes Live TODAY! « Michigan Skeptics Association: Do Jehovah’s Witnesses Believe in the Theory of Evolution? Can you believe it – AtheistTV! I just found out about this yesterday. We have partnered with content creators in the atheist community to bring engaging and entertaining content to AtheistTV. We are working with experienced producers to develop new, original programming that will launch soon. If you are interested in developing content or submitting existing content to AtheistTV, please contact us. Current content partners include: the Richard Dawkins Foundation, the Atheist Community of Austin, American Atheists, The Friendly Atheist, and Keith Lowell Jensen. So if you have an atheist or skeptical YouTube channel or just want to create a show of your own, now might just be your chance. 🙂 I hope everyone will watch it and give Roku a reason to keep this network going. Tagged American Atheists, AtheistTV, Roku. Bookmark the permalink. 2 Responses to AtheistTV Goes Live TODAY! I wanna know how you left the JW’s, were you dis fellow-shipped and why? I also just left the Cong because Religion just didnt make sense to me, I grew up in the cong until i became wise enough to ask questions. to my suprise none of my questions could be answered. I still believe God exists though, but all forms of religions do not make sense and i find them rather ridiculous. I am in varsity now so my family does not bother me much about attending meetings, they dont even know i quit. I was not DFed. I just decided I had had enough and stopped going. Years passed before I decided this would be my final decision. You could check out the About page to pick up some more about my past. The About button is near the top of the page.